This book introduces the concept of the "unconscious entity" and reveals it as the most important concept in psychology. The book begins by presenting that the basic emotional need of humans is the need to be emotionally comfortable. Anything, that makes us emotionally uncomfortable, is a frustration of our basic emotional need, that then produces anger. The bigger the frustration, the more anger is produced. If that anger is not immediately expressed, it becomes repressed, and then stored in our mind as "unconscious entity," making any unwanted feeling we have, more unwanted. Unconscious entity arises from our unexpressed anger. It manifests itself as unwanted feelings. The feeling we least want is the very feeling most likely to be produced by our unexpressed anger. To reduce the intensity of an unwanted feeling, or to remove it completely, we must convert the unconscious entity, in our mind, back to expressed anger, which we can do, unconsciously, when we talk to a listener about what we dislike, or hate. What we dislike, or hate, will be unconsciously equated with an unconsciously perceived part of our listener. The anger is then directly expressed to that part and will be metaphorically hidden. This reveals a new dimension in human communication that has the capacity to cure psychogenic illnesses. Anger, arising from our stored unconscious entity, can also be reduced when it is expressed, inwardly, to ourselves, as in any hard work, exercise, or self-punishment, or by punishment inflicted by others. Reducing our unconscious entity makes us less emotionally uncomfortable, which is the same as making us more emotionally comfortable. That meets our basic emotional need indirectly. 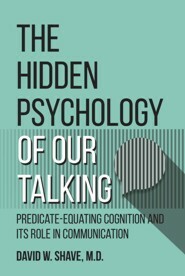 This book shows how we unconsciously hide our expressed anger, in our talking to a perceived listener. We do it by utilizing unconscious predicate-equating that this book shows, for the first time anywhere, is a prominent cognition of humans, and not limited to, or being diagnostic of, schizophrenia, as psychology and psychiatry now believe. It reveals the hidden and real cause for homelessness, PTSD, pedophilia, and why people senselessly kill as in mass killings.This book is a "must read," not only for anyone associated, in any way, with psychology or psychiatry, but anyone interested in the origin of their own unwanted feelings, and wanting to rid themselves of them. The Author is a retired psychiatrist. He has a Bachelor of Arts Degree from Albion College at Albion, Michigan, and both a Master of Science Degree and a Doctor of Medicine Degree from the University of Michigan at Ann Arbor, Michigan. He did a rotating internship at Gorgas Hospital, US Panama Canal Zone, and then completed a psychiatric residency at the Mental Health Institute, Cherokee, Iowa which was affiliated at that time with the University of Iowa. After completing his medical training, he was associated with the medical staff of Peninsula Regional Medical Center, Salisbury, Maryland and retired as its Chief of Psychiatry. He was a Consultant in Psychiatry for the Eastern Shore Hospital Center, a large state mental hospital at Cambridge, Maryland. He served in the US Air Force, and the US Air Force Reserve, attaining the rank of "Colonel" as a military psychiatrist. He has published and lectured extensively in the field of Psychiatry, especially regarding unconscious communications. This book has evolved from the Author’s many published and personally presented academic papers, and his past six academically published books on unconscious communications.